You drive a car, you ride a motorcycle, but what do you do with a boat? On a boat, you take the helm. The big question is, do you have the skills you need? Not all boaters are required to have a license in order to take the helm, but all boaters do have a responsibility to learn about boat operation, communications, navigation, and life-saving techniques. Statistics show that boater education saves lives. In Florida, a person born on or after January 1, 1988 is required to have completed a boater education course or pass an equivalency exam in order to operate a boat with a motor of 10 horsepower or greater. So if you are 26 or younger, you have to learn the rules of the water before taking the helm. For everyone else out there, there is no requirement. 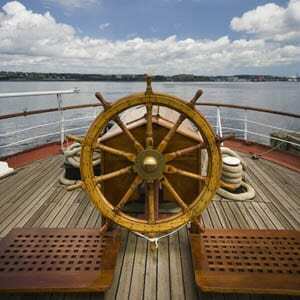 So how do you get the skills you need to take the helm with confidence? Freedom Boat Club has your answer. We have teamed up with Discover Boating to offer a hands-on-clinic for powerboaters of all levels at the upcoming Southeast U.S. Boat Show. It doesn’t matter if you have been operating boats all your life or have never stepped a foot on one, you will benefit from these courses. The three-hour clinics will be held April 11, 12, and 13 at Metropolitan Park Marina from 10 a.m. to 1 p.m. or from 2 p.m. to 5 p.m. Topics include “Powerboating Made Easy” and “Advanced Docking Skills.” Our goal is to give people the skills to operate their boats with confidence. We want to show people how fun and easy boating can be when you know what you are doing. This training is only available at the boat show and provides a much-needed option for boaters. All clinics are taught by USCG licensed captains. They are designed for boaters age 14 or older, from novices to seasoned captains. Participants must be physically able to participate as an active crew member while underway. As a woman and an avid boater, I want to encourage absolutely everyone to take part in these courses. Boating is not just for men anymore. If you don’t think you have what it takes to captain a boat, you might be surprised. We hope you will join us at the boat show to learn some valuable skills that will make you a confident and safe boater. Boats, Boats, and More Boats…….